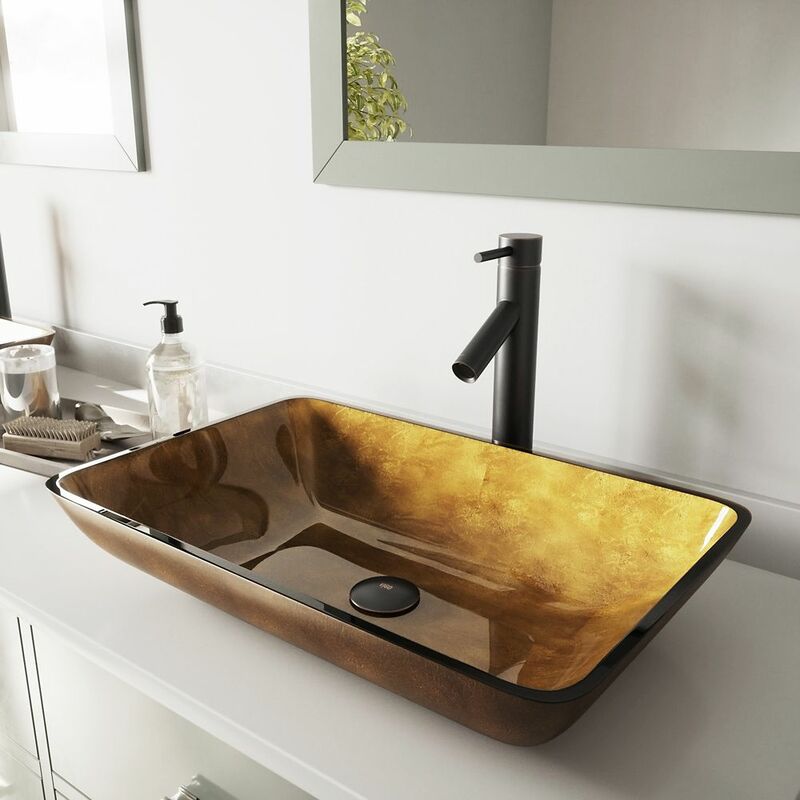 Solid, durable tempered glass finished in rich russet makes the VIGO 22inch Rectangular Russet Glass Vessel Bathroom Sink as strong as it is stunning. This handmade rectangular vessel bowl bathroom sink is built to be a long-lasting statement piece in your home. This set includes the cascading VIGO Niko Vessel Bathroom Faucet in a rustic antique rubbed bronze finish, as well as matching pop-up drain and mounting ring. The natural hue of this "Atlantis" VIGO sink will complement any bathroom decor. Style, quality and attractiveness set this sink in a league of its own. Handmade with possible unique and slight colour variations, so no 2 sinks are identical. Solid tempered glass construction, Scratch-resistant glass; Non-porous surface prevents discolouration and fading, Stain-resistant, easy-to-clean surface, polished glass interior with textured exterior. Above-counter installation. Rectangular Glass Vessel Sink in Copper with Dior Faucet in Antique Rubbed Bronze is rated 4.3 out of 5 by 3. Rated 5 out of 5 by Anonymous from Beautiful Sink Set for a Great Price We picked this set to go with our powder room remodel. It looks fantastic with the new Amarone granite and other new finishes. The sink set is the way to go because it includes the sink, stand ring and faucet along with all connection pieces. Very happy with the quality and ease of installation. Rated 5 out of 5 by susie from Mrs I bought this for my bathroom remodel and it is beautiful !